Recently the Bloomer PD received a generous donation to the K9 fund from PMI. 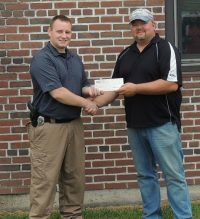 A check for $2,500.00 was presented to Officer Brandon Poppe, Bloomer PD's future K9 handler, by Eric Lewis, PMI Plant Manager. With the help of this donation the Bloomer PD has officially made the halfway point to their fundraising goal of $25,000.00. "We are extremely grateful for their generosity," said a spokesperson for the Bloomer PD K9 Fund.